Day 3 in the books, and still all chalk (Umass over LaSalle doesn’t warrant upset status). That doesn’t mean the underdogs didn’t put up a fight though. VCU hung tough with Rhody, and Richmond erased a 17 point deficit and gave a real scare to the second-seeded Bonnies. St. Joseph’s and Davidson both coasted, and will look to steal an NCAA tournament bid in the next two days. Dowtin wasn’t a scoring machine in the 2017 A10 Tournament, but he was commanding the ship, and lead the Rams offense with a 13 to 1 assist to turnover ratio. Jeff was fantastic once again, with 18 points on 7-10 shooting from the field and 3-4 shooting from three. Everytime VCU went on a run, it felt like Dowtin answered with a momentum killing bucket. 2-25 from deep. That’s not a stat that usually accompanies winning teams. The 8% 3pt percentage was likely a result of exhaustion. 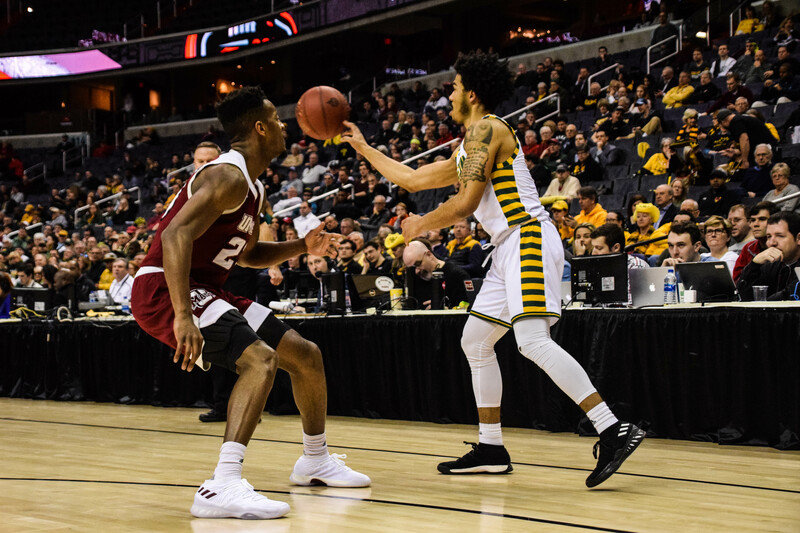 After a tough game against UMass on Thursday, GMU looked like their legs were completely shot. Almost every miss was short. A decent day from three might have made this mundane game somewhat interesting. Who woulda thunk that the Bonnies would win with Jaylen Adams scoring only five points on 1-7 shooting. It certainly was one of Jays worst games of the season, and he seemed to be hesitant all night after missing his first two three-pointers early on. Not all is lost though. The last time Adams scored 5 in a game, he followed it up with two 40+ point performances. The Cats are playing the best ball in the A10, and are playing with tons of confidence. In their 6th win out of their last 7, Davidson stormed out to a 26 point lead, and then cruised the rest of the way. Even though the Bonnies are on a 13 game win streak, with Courtney Stockard’s health in doubt, Davidson will likely be the favorite to advance to the A10 finals on Sunday. Is Rhody’s Best Basketball Still yet to be Played? Rhody hasn’t played their best basketball lately, but Friday was a step in the right direction. The defensive intensity was there, and they hit enough shots to pull away from VCU in the end. The beast may not have been woken yet, but it’s there, and I expect to see it soon. Can Saint Joseph’s Stay Hot From Deep? St. Joseph’s met George Mason’s dreadful offense by shooting 45% from three. While they cruised to a victory on Friday, Saturday will bring back the Rams (who they beat by 30 the last time they met) and their significantly larger interior presence. It’s hard to imagine St. Joseph’s being able to score all their points in the paint, so another solid deep shooting game is much needed. Perhaps the biggest question affecting play on Saturday is Courtney Stockard’s health. Stockard was 8-9 from the field with 19 points in the 30 minutes he played against Richmond. The Bonnies missed him desperately when he was forced to exit, and immediately squandered their 17 point lead. The path to winning the A10 Tournament becomes much more difficult for the Bonnies if Stockard is out. Was the Ending to the Bonnies Game a One-Time Thing? The Bonnies didn’t exactly clutch it out Friday night. Missed free throws, turnovers, botched layups, and careless passing all culminated in a 17 point lead evaporating in a matter of minutes. Missing 11 freebies is not going to win you a lot of games in March. For the Bonnies to be able win games in this tournament, and in the NCAA’s, they have to hope this is a one time occurence. Can Peyton Aldridge be Stopped? Right now it feels like Peyton Aldridge can virtually score at will. Peyton lead all scorers against St. Louis with an easy 35 point performance on 13-19 shooting. Aldridge has been a Bonnie killer his entire career, and had his career best performance in their last matchup, where he scored 45 points and made eight threes. We’ll see if he can continue his recent tear tomorrow against the Bonnies. Awesome ending to the A-10 Championship today, and just a great day for the league as a whole. Davidson did what I fully expected them to do all weekend, which was show everyone they belong, and quite frankly they might make the deepest run in the NCAAs of any A-10 team. I’m a little nervous for URI right now that they may be one and done, but they clearly have the firepower to beat anyone. Hopefully, they are able to fix their defense in time for Thursday or Friday. St. Bonaventure needs Stockard in a bad way. He has elevated his game over the past month and at times carried the Bonnies down the stretch. If he is good to go, Bona can outscore just about anybody. Interested to see who they get paired with, they feel like the most matchup dependent A-10 team moving into next week.